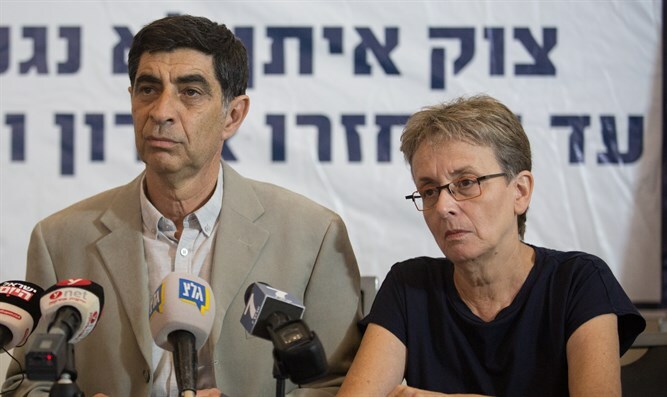 Parents of IDF killed-in-action soldier held in Gaza by Hamas Hadar Goldin, Leah and Simcha Goldin, finished an hour ago at the United Nations headquarters in New York meeting with most of the representatives of the countries participating in the conference. During the meetings the Goldins raised the Security Council resolution of last December and the European Union's decision that Hamas flagrantly violates international law in holding IDF soldiers and Israeli citizens. The Goldin family coordinated all meetings with the government representative to the conference of donor countries Minister Tzachi Hanegbi, and with the Israeli delegation to the UN headed by Ambassador Danny Danon. Simha and Leah Goldin say they expect Netanyahu to make his statement after their last meeting where he said there will be no arrangement without the boys' return. "We expect Netanyahu to declare that the Israeli condition for an international arrangement in Gaza is the return of the sons first. Four years after the end of the Protective Edge war, it's time for Netanyahu to blame the United Nations for initiating the cease-fire that was breached by Hamas and during which Hadar was abducted to a tunnel in Rafah. The Israeli government never demanded that the United Nations be held responsible for the abduction and breach of the ceasefire and to do this". Prime Minister Binyamin Netanyahu continued his political meetings during his visit to the UN General Assembly in New York, where he held an important meeting with Egyptian President Abd al-Fatah al-Sisi. They met for two hours and discussed regional developments and the situation in Gaza. Today, the Prime Minister will address the General Assembly. In his speech, Netanyahu is expected to address the issue of Iranian armament and nuclearization. The Prime Minister will also address the UN's own contribution through its institutions such as UNESCO and UNRWA to harm Israel and incitement against the State.